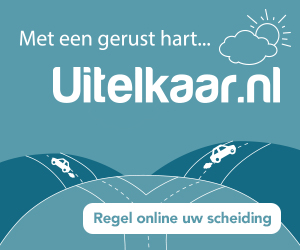 On September 8th, Justice42 launched its first online platform: uitelkaar.nl. Today, they are proud to announce that the platform fulfilled all the requirements needed to be officially recognized by the Raad voor Rechtsbijstand (Legal Aid Board), and thus the Dutch Government. This was made official on October 31st in the Staatscourant (State journal) and represents a big step forward for Justice42 and their online divorce resolution platform. This not only is a seal of quality and of approval by the Government but also entitles the users of the platform to subsidies, which makes it the only one in the Netherlands. The normal price of a divorce settled through the platform is 425€ per person and the price goes down to 110€ per person if they are indeed entitled to subsidies. If you wish to know more, the full press release can be read here and the Staatscourant article can be found here.